The Horizon Navigator isnavigated by Capt. Robin Espinosa, right, Chief Mate S.L. Sam Pirtle and Second Mate Julie Duchi. The all-female deck crew might be the first in U.S. Merchant Marine history. 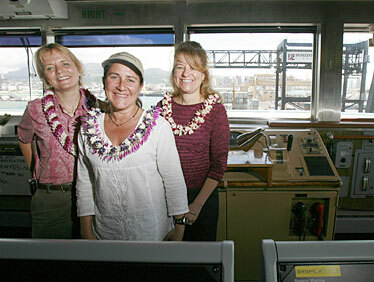 For the first time in Hawaii's maritime history, three female bridge officers were at the helm of an 800-foot container ship that arrived at Honolulu Harbor from Los Angeles on Wednesday. The three -- Capt. Robin Espinosa, Chief Mate S.L. Sam Pirtle and Second Mate Julie Duchi -- were assigned to the same ship by chance through their union's bidding process. The women are in charge of the Horizon Navigator, carrying about 900 containers, with a total of 25 crew members. The Horizon Navigator carryies about 900 containers and a total of 25 crew members. Women were virtually nonexistent in the male-dominated industry a few decades ago, and the U.S. Merchant Marine service remains dominated by men. But more women are moving up the ranks in all areas of ship operations, and female merchant mariners have gained respect in the rigorous field. 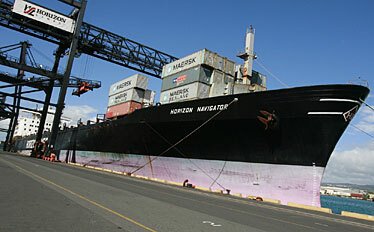 Matson Navigation Co., the state's largest ocean carrier, made maritime history in 1988 when Lynn Korwatch became the first female captain of a large commercial vessel in the Pacific, Matson's SS Maui. Capt. Robin Espinosa, with Chief Mate S.L. 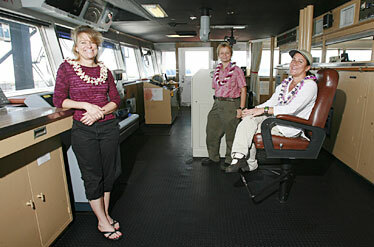 Sam Pirtle, left, and Second Mate Julie Duchi, are in command and on deck of the container ship Horizon Navigator. Horizon Lines Inc. made Hawaii maritime history this week when an 800-foot container ship arrived in port with women occupying its top three bridge posts. The Horizon Navigator, carrying about 900 containers and a total of 25 crew members, arrived at Honolulu Harbor Wednesday from Los Angeles with Capt. Robin Espinosa, Chief Mate S.L. Sam Pirtle and Second Mate Julie Duchi at the helm. It was the luck of the union's bidding process that brought the three female bridge officers together on the same bridge, as the U.S. Merchant Marine service remains dominated by men. The International Organization of Masters, Mates & Pilots in Honolulu represents about 150 members, 10 percent of whom are women. Fewer than 1 percent were women 30 years ago, according to the union. "It's a real anomaly; it's very unusual," said Espinosa, who is based in Charleston, S.C., and has been sailing for 25 years. "When I first started, I was pretty much the only gal around. I never worked on a ship with any other women for the first 10 years." The first women were allowed to enter maritime academies in the 1970s to be licensed deck officers and engineers, which allows them to go anywhere in the world on any kind of ship, said Randy Swindell, the union's port representative. However, more women are moving up the ranks in all areas of ship operations, signaling a new era for female merchant mariners who have gained respect in the rigorous field. Matson Navigation Co., the state's largest ocean carrier, made maritime history when in 1988 Lynn Korwatch became the first female captain of a large commercial vessel in the U.S. Merchant Marine, Matson's SS Maui, said spokesman Jeff Hull. Pasha Hawaii Transport Lines, Hawaii's third-largest ocean shipper, has never had a female captain or female bridge team, said general manager Reggie Maldonado. Breaking into the industry, where superstitions about women on board being bad luck abounded just a few decades ago, was challenging for the female officers who worked harder to prove themselves. Throughout her career, Espinosa said, she has staunchly rejected being treated any differently from men on the ships. "I worked harder than most men because I wanted so desperately to be accepted," she said. "I'm not a big woman and I'm not real strong; some things physically I just couldn't do." While there was some prejudice, the union's training programs placed the women on equal footing for jobs, said Espinosa, 49, who supervises overall operations and the ship's course and speed. "Sure, I got catcalls and whistles from guys," she said. "But it was a good thing for us that we did come through the union so we have the same qualifications as any guy has had." Espinosa developed her love for the sailing as a child growing up in a family of sailors and was inspired by late marine conservationist Jacques-Yves Cousteau. She originally attended the Texas Maritime Academy to become a marine scientist, but was later recruited into the marine transportation program and drawn to going to sea to travel the world while making a significant amount of money. Duchi, 46, a Honolulu resident who as second mate is in charge of navigation, also was raised in a sailing family and shared that dream. "At first I thought it was going on a sailboat and getting paid for it," she said. The job turned out to be much more challenging than she had imagined. While the crew uses GPS navigation, which allows her to simply push a button to direct the ship from one point to another, she says she still does celestial navigation purely for fun. "It's been a great career. I really love it; it's a lot of fun and freedom," Duchi said. "But it's just not for everybody. You have to be willing to give up being at home." Among the greatest challenges is the time spent at sea, typically six to 10 weeks at a time. Espinosa said the schedule is tough on her husband and 18-year-old daughter. "It's real tough. We're lucky because we're in port so often, so ... we're in good communications with our families," she said. For Pirtle, 49, whose duties include getting cargo on and off the ship, the rigorous schedule has made it difficult to get back into the dating scene. She is usually gone anywhere from 35 to 70 days at a time. In addition, men are often intimidated by her career, which includes being the crew's medical officer. "I did like a year of Internet dating," she said. "I was honest about what I do for a living, but that just scared off everybody. It was like I was attracting men who wanted a woman to push them around." While the pace of their lives is much faster than a typical career, the women say they would not change a thing. "The thing I always tell people is that my career is so much a part of me I couldn't even conceptualize anything besides going to sea," Pirtle said.